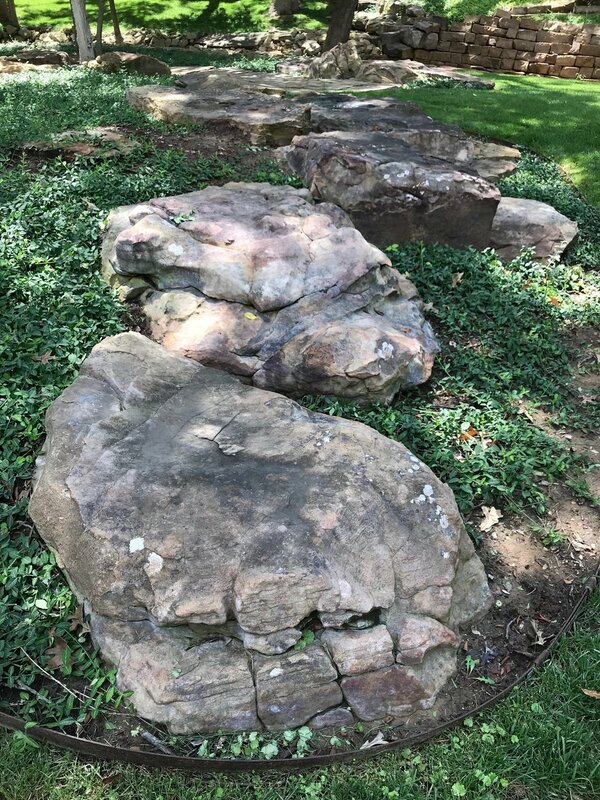 Several years ago, we had a landscaper bring in some boulders (or “large rocks” as folks in mountain regions may call them). For Oklahoma, they seemed like boulders. There was an area of the yard where growing anything was very difficult. I didn’t want dirt, mud, or a bed full of weeds staring at me every time I looked out the windows. So, the boulders were a great option for this part of the yard, and we also planted a robust ground cover in hopes it would take over the dirt. It worked. It’s a beautiful area of our yard. There are several places in the house where one can sit and look at this garden area. The ground cover did its job rather quickly, but no one told me it would keep growing. It could even cover the boulders if it wasn’t trimmed. This summer has been busy. We were out of town all but four days in the month of July. August was packed with preparing sermons for fall kickoff at Crossings, finalizing plans for a pastors’ gathering in Florida, visiting treasured friends at the National Association of the Church of God camp meeting in northwest Pennsylvania, and usual unending meetings required to have our staff ready for a new ministry season. I’m a neat freak. A detail freak. By Labor Day weekend, I could not stand to look out our windows and see how the ground cover had covered up the large rocks. It had to be trimmed. I knew it would take at least half of the day to get it done. Hiring someone to do it was out of the question. So, I walked out of my garage with tools in hand. I prepared for a morning that would find me on my knees, working with newly-sharpened lawn scissors. Every now and then, I’d have to sit on one of the rocks to catch my breath, stretch my legs, and drink some water. It was a typical hot Oklahoma summer day, but I was determined to get this done. This photo shows about a third of this area of the yard. I stayed with it, and even though I could barely stand up when I was finished, I sat on the little bench we’d placed in that garden and enjoyed the fruit of my labor. I love that feeling of accomplishing something. Honestly, you can work in a church and go for months without having evidence that anything has been accomplished. I think that’s why I like doing stuff like trimming ground cover or painting a room. I can step back and see immediate results of my efforts. The ground cover reminded me about some of the real issues in life. I was a bit surprised at what was hiding beneath the beautiful ivy. I discovered weeds and styrofoam cups that had blown in from a jobsite nearby. I finally found where the armadillos on the property are living. I saw a few remnants of previous attempts at another type of ground cover that never worked. As I trimmed the ground cover, I was reminded how easy it is to hide things. Most of us get pretty good at image management. The basic premise is that we hide what we are ashamed of and hope those things will never be known or discovered by someone else. Or, we attempt to create the image we want others to see and hope they assume things about us that may not be true. Let’s face it: none of us want our weaknesses known. We prefer people not know our insecurities, our quirks, or our tendencies to say or do things we may later regret. Jesus had a way of calling people around Him to a frank, open, and honest conversation about the truth of their lives. Think of the woman who had been hemorrhaging for many years. All she wanted to do was walk up behind Jesus and touch His robe. She didn’t need a conversation. She preferred anonymity. She had one last chance at getting well and this was it. She found her way through a crowd that was “pressing in on Jesus” and grabbed the edge of His garment. She was immediately healed. The bleeding stopped. As she tried to slip away into the crowd, Jesus asked a question He already knew the answer to, “Who touched me?” She was most likely terrified, embarrassed, and ashamed. At first glance, one could wonder why Jesus felt the need to call her out. Why not allow this embarrassing situation to be healed quietly? But Jesus had more than physical healing in mind. She fell at His feet, “trembling with fear, and told him the whole truth” (Mark 5:33). Those few moments of humiliation quickly turned to exhilaration. Jesus called her “daughter.” Suddenly, she was no longer a sick woman to avoid. Her condition of constant bleeding isolated her due to Jewish law that rendered someone in her condition as “unclean.” This meant: don’t touch her or you will be unclean, too. Don’t sit where she’s been sitting. Avoid her at all costs. Until now. Now this great man of God, this healer, this Jesus, God-in-flesh, restores her back into relationship with the community. She’s clean. Touchable. And very important to this great God of extravagant love. My imagination runs wild as I think of how people began running to her wanting to hear all about it. The person no one wanted to touch is now someone everybody wants to be with. That’s exactly what Jesus has done to all of us who feel inadequate, undeserving, or afraid to approach Him. He approaches us. He forgives, heals, restores. He loves to bring into the open the things we have been hiding, things we’re ashamed of, the private suffering, those things we assume make us unlovable and untouchable. Every now and then, I wish I could just walk up behind Him and touch His robe. I don’t like to trouble people. I prefer blending into the crowd rather than being watched by one. But Jesus knows our private pain. He knows all about that “thorn in our flesh” that won’t go away. He knows the regrets. He knows us well. He always gives His best to those who leave the choice with Him.